The Chicago Rehab Network (CRN) with a consortium of nonprofit organizations including: Bickerdike Redevelopment Corporation, Bethel New Life, Hispanic Housing Development Corporation, Heartland Housing, The Resurrection Project, The Renaissance Collaborative, Acorn Housing Development, Claretian Associates, Genesis Housing Development Corporation and Lawndale Christian Development Corporation, intends to apply for grant funds through the Neighborhood Stabilization Program 2 (NSP2) under the American Recovery and Reimbursement Act of 2009. This summary statement includes information regarding the proposed targeted geography, the proposed budget and the proposed uses of the funds. CRN will accept comments concerning this proposed NSP2 plan summary from July 3, 2009 through July 13, 2009. Written comments may be mailed to Rachel Johnston at Chicago Rehab Network, 53 West Jackson Blvd. Suite 739, Chicago, Illinois 60604 or email Rachel@chicagorehab.org. A public meeting to hear comments will be held on July 9th at 6pm to 8pm the CRN offices, 53 W. Jackson, Suite 739, Chicago, south bank of elevators. City Council passed two ordinances concerning the lease of city assets. The City Asset Lease Agreement Disclosure Ordinance requires the publication of lease agreements and the accounting of lease proceeds for city assets valuing more that $10 million dollars. The second ordinance pertains to assets with a value greater that $100 million dollars and requires that any such ordinance related to the lease or sale of city assets must go through a mandatory 15-day review prior to consideration by the city council. Both ordinances come amid much-publicized missteps concerning the recent lease of the city's parking meters which received city council approval just two days after its introduction. The new ordinances will improve transparency in these kinds of deals and ensure city leaders and the public more time to review future proposals to sell or lease city property. The city has announced a Request for Proposal (RFP) for the Chicago Department of Family and Support Services Homeless Student Support Initiative. Under this program, the DFSS will partner with the Board of Education to address the housing and employment needs of Chicago Public School students enrolled in the CPS Homeless Education Program. HUD has awarded approximately $95 million in Tax Credit Assistance Program funds to the State of Illinois. TCAP is a new program authorized under the Recovery Act that could help fill financing gaps resulting from the economic and credit crisis in projects already awarded Low Income Housing Tax Credits. The grant program will be administered by state housing finance agencies-the Illinois Housing Development Authority, in this case. IHDA has already begun its project selection process. At least two application rounds will be undertaken and will follow according to when projects received their initial LIHTC allocation. More details on IHDA's project selection process can be found by visiting IHDA's website. House Financial Services Committee Chairman, Barney Frank, has proposed a new source to fund $1 billion for the National Housing Trust Fund (NHTF). The National Low-Income Housing Coalition reports that Chairman Frank has submitted HR 3068, TARP for Main Street Act of 2009 which includes a provision to direct $1 billion to the Trust Fund using revenues from dividends paid by financial institutions assisted by the Troubled Asset Relief Program (TARP). TARP for Main Street also includes $1.5 billion towards the Neighborhood Stabilization program and $2 billion towards assisting multifamily housing at risk of foreclosure. More information about the National Housing Trust Fund can be found by downloading the National Low-Income Housing Coalition's NHTF FAQ. CRN proudly announces the release of its first Talking to Walls podcast covering Bickerdike Redevelopment Corporation's recent opening of their Section 8 waitlist. This episode takes you into the heart of the application process where Bickerdike staff and volunteers sort through the responses to the 5000 applications distributed during the application process. With interviews from Bickerdike staff Carmen Conde and Joy Aruguete, several volunteers, and CRN staff member Andy Neilsen , this segment highlights the overwhelming need for more affordable housing in Chicago as well as the tight restrictions in place for corporations like Bickerdike in accepting tenants. You can listen to the podcast at CRN's website. A project of the Chicago Rehab Network, Talking to Walls is a conversation about affordable housing in Chicago neighborhoods. In each episode you will hear from a variety of people whose lives are closely tied to housing issues, ranging from tenants and neighborhood residents to not-for-profit housing experts. Giving voice to unheard individuals, we bring their concerns to the forefront of public consciousness. Talking to Walls takes housing conversation from places like City Council board rooms to neighborhood streets, providing clarity to complicated policy surrounding affordable housing. If you would like more information about the project please contact Jessica Friesen at Jessica@chicagorehab.org or Erin Potter at Erin@chicagorehab.org. Stay tuned for future episodes! Last week Mayor Daley and a Chicago 2016 delegation flew to Lausanne, Switzerland to make their pitch to the International Olympic Committee. This meeting is the last of its kind until the final pitch and selection on October 2 in Copenhagen. The meeting, billed as an opportunity for a serious look at each of the four candidates' plan, featured a presentation from the host followed by a period of questions from the group of 109 voting IOC members that will elect the host of the 2016 Games in October. The biggest surprise of the conference centered on what had been a much-discussed feature of the Chicago bid: the lack of a full financial guarantee. While other host cities' national governments serve as a financial backstop for the Games budget, Chicago-like previous American hosts-did not include such a provision. Instead, Chicago's plan called for a combination of private insurance and limited insurance from both City and State governments. However, on Wednesday Mayor Daley pledged to sign the IOC's full financial guarantee document, a divergence from the original plan. City officials have said that this matter will be discussed before the City Council before it goes into effect, though no date has been set. Many insiders still consider Chicago to be the front-runner for the 2016 Games. CRN will continue to track and update on the status of the city's Olympic Bid. Visit CRN's Olympics page for more information. The new JCHS study finds, to no surprise, that the housing and economic crisis will continue on for some time despite the efforts to spur economic recovery and signs of falling home prices. The study points to increasing unemployment, tightening lending standards, and the decrease in home value as primary factors in the stagnant housing market. Despite signs of the home prices leveling from inflated prices at the height of the housing boom, homebuyers are finding it difficult to obtain credit and the high number of households who are "underwater"-that is, owing more in their mortgage that the value of their home-mean that very few units are moving off inventory. Additionally, the study finds that minority communities are especially affected by the housing crisis. Higher incidences of high-cost loans made in minority communities resulted in higher foreclosures. Unemployment among minorities was also higher. The full report can be downloaded by visiting the JCHS website. Earlier this year, the City of Baltimore filed a lawsuit against Wells Fargo for discriminatory lending practices, alleging that the bank disproportionally made high cost loans to African-Americans. In light of this, the Chicago Reporter took a closer look at Wells Fargo's lending practices here in Chicago and found a similar disparity. Using 2007 data, the Chicago Reporter found that more than half of Wells Fargo's loans made in mostly African American communities were subprime, compared to just 14.5 percent in White areas. Last year, Illinois Attorney General Lisa Madigan filed a lawsuit against Countrywide due to an investigation by the Chicago Reporter which revealed that Latinos and African Americans are much more likely to be given a high-cost loan that Whites or Asians. Invitations have been sent to CDCs to participate in the Metro Chicago CDC Census, the first sustained effort to document the work of community development corporations in Metro Chicago. Visit our Census Website or email census@chicagorehab.org for more information. CRN wishes farewell to VISTA's Emily Sipfle and Jennifer Barriere, who completed their year of service with CRN on June 19th. Welcome to new VISTA's Adam Morgan and Katie Brennan! Congratulations to Genesis Housing Development Corp. Ribbon Cutting July 2nd at Noon. The Regional CHASE Homeownership Center will celebrate its opening on Tuesday, July 21st from 9:00 am - 11:00 am 4370 W. 79th Street, Chicago, IL. RSVP by Friday, July 17th to Yolanda Zamarron at 708-450-3702 or by email at yolanda.zamarron@chase.com. With only one workshop left in this year's CRN's Community Development and Empowerment Series workshops, participants are learning the final stages of affordable housing development. Last week, instructor Angela Hurlock, who serves as executive director of Claretian Associates, took the Project and Construction Management class to site visits of two affordable housing developments under construction in Chicago's north and west sides, Heartland Housing's Hollywood House and Lawndale Christian Development Corporation's Gideon Homes. Hollywood House in the Uptown neighborhood, an affordable senior housing rehabilitation project, and Gideon Homes in North Lawndale, an affordable homeownership development featuring rehabbed 2-flats and condominiums, show the breadth of affordable housing development in Chicago. Through these site visits, participants learn about the applying development concepts in practice and in the field. 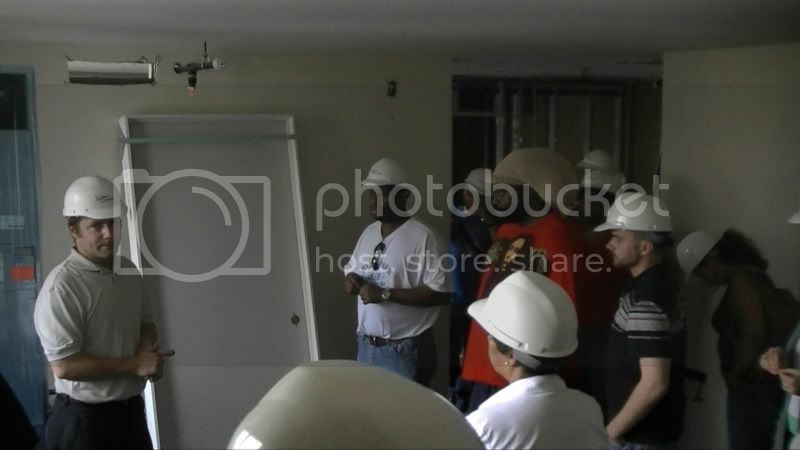 Photo: Participants take a tour of Hollywood House, an affordable senior housing development undergoing rehab.